As an inbound marketing agency, in addition to actually being a B2B company, we have the opportunity to work with many types of B2B organizations on a daily basis through our marketing retainers. One of the most common challenges I hear across the board relates to keeping the sales funnel filled with warm leads. The good news is that today, more than ever, marketing is equipped to solve this problem. Setting realistic expectations is vital, however, as warm leads don’t magically appear out of thin air – they require hard work, persistence, and time. Most B2B organizations I speak with are currently dependent on some form of paid advertising and/or mass outbound tactics to keep leads in their pipeline. Year over year, their costs per lead grow while overall effectiveness shrinks. I've seen cases where sales dropped dramatically when something as simple as the minimum cost per click on a top keyword suddenly jumped from $2.00 to $4.00. You don't have to be a seasoned CFO to recognize the unsustainable and dangerous pattern here. Fortunately, inbound marketing and demand generation make it possible for B2B organizations to control the quality and quantity of marketing generated leads without having to depend on paid advertising and other mass outbound tactics. Inbound marketing and demand generation programs are not instant gratification tactics, though. You'll need planning, people, content, software, and processes - all of which require time and money. The benefits of having a sustainable marketing and sales engine pay off over the long run, however. According to a study by Kapost on the cost and ROI of content marketing, it took 18 months for inbound tactics to outperform PPC ads. Additionally, cost per lead dropped by 80% in five months. The more time and attention you invest in building the foundation – buyer personas, universal lead definitions, ideal customer profiles, buy cycle content mapping, sales and marketing alignment, CRM and marketing automation integration, and content marketing – the better the results. 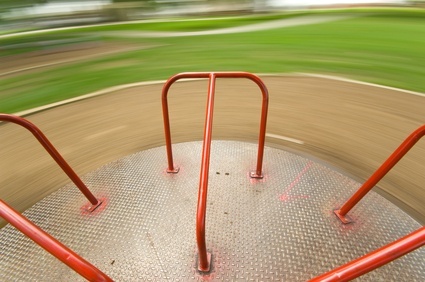 I like to compare the building of inbound programs to the merry-go-round on the school playground. Everyday after lunch a group of kids would pile on, and three of the strongest boys would take their positions around the perimeter. The first few revolutions took a lot of strength to get going. By the third time everyone had chanted, "Faster, faster, we need another master," we were zipping around from the momentum alone. Inbound programs start slowly and build momentum over time. Don't get me wrong, paid advertising and other mass outbound tactics certainly have a place. For instance, many of our clients run short-term PPC campaigns while we are laying the foundation of their inbound marketing and demand generation programs. The goal is to create a good balance between paid ads and inbound marketing. All of these channels can be of enormous value when used as part of an integrated plan for engaging with prospects, leads and customers. Years ago, my passion for small business and startups led me to pursue a career in marketing. At the time, new web technologies had leveled the playing field, allowing up-and-coming businesses to win greater market share against multi-million dollar advertising budgets. Today, marketing - supported by valuable content and automation software - has the opportunity to play an even greater role in business growth with inbound marketing and demand generation. Remember, it takes time to build and ramp up an inbound marketing program. But if you are committed to inbound marketing and to maintaining an inbound marketing program, you will have a very powerful marketing engine.